Emilio Botin, one of Spain’s most powerful men who transformed Santander from a small domestic lender into the eurozone’s biggest bank, has died of a heart attack, aged 79. Sources familiar with the matter said his eldest daughter Ana Botin, currently head of Santander’s British business, was expected to be approved as the bank’s new chairman during a board meetinglate yesterday. Such a move could spark controversy, with banking dynasties coming under criticism after a scandal at Portugal’s Banco Espirito Santo, where the founding family’s holdings are being investigated over financial irregularities. “Succession shouldn’t just be saying ‘my daughter’s going to take over’,” said a corporate governance expert at a global asset manager which owns Santander shares, speaking on condition of anonymity. But others said Ana, who has spent most of the last 25 years at Santander, could provide welcome continuity. If Ana is confirmed as group chairman, it will leave a gap at Santander’s UK arm just as it prepares for a separate listing. UK Finance Director Nathan Bostock has been lined up as her replacement, but he only joined a month ago. The UK arm is also looking for a new chairman. Emilio, ‘El presidente’ to co-workers and the third generation of Botins to run Santander, was at the forefront of a drive to create global banks, offering a one-stop shop to multinational companies and a range of services to consumers. He used a keen eye for deals to spread Santander’s red-liveried brand with its stylised ‘S’ logo around the world, amassing €1.4 trillion of funds and nearly 200,000 employees. “I had a meeting with him last week and he was well and in good form. It has been a surprise and a blow. 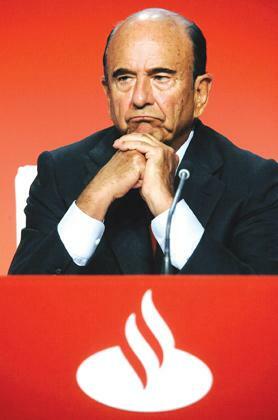 Emilio shook up Spanish banking with a campaign to attract depositors in 1989, forcing rivals to compete on price, and bought troubled Banesto in 1994 to create Spain’s biggest bank. He took advantage of cultural and language ties to expand rapidly into Latin America, and in 2004 snapped up Britain’s Abbey National for more than £9 billion. More canny dealmaking followed. In 2007, Santander made €2.4 billion in three weeks through deals to buy and then sell Italian bank Antonveneta. And while partners RBS and Fortis were driven to seek state bailouts after a carve-up of ABN Amro on the eve of the financial crisis, Santander emerged comparatively unscathed with the Dutch group’s healthier Brazilian arm. The expansion helped to shield Santander from the eurozone debt crisis and Spain’s long-running recession, with the bank now making only about 14 per cent of its profit at home.